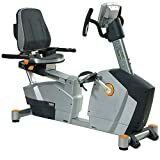 The DKN EB-3100i recumbent exercise bike is equipped with a 14kg (30.8lbs) flywheel for smooth operation and provides a range of 32 computer controlled resistance levels ensuring challenging workouts. It is supplied with a multifunctional colour LCD display providing constant feedback on crucial workout statistics as well as a choice of 4 user profiles and 15 programmes (1 Manual, 12 Pre-Set: 3 Beginner, 3 Advanced and 3 Performance, 1 Cardio, 1 Watt). It also enables you to measure your heart rate wirelessly (chest belt optional) or via grip sensors. In addition, the bike is compatible with the DKN iWorld and DKN Motion applications, which ensures countless possibilities of interactive workouts. The DKN Motion supports iPad, iPad Mini and Android tablets (3.1 or higher and 1280 x 800 resolution), whereas the DKN iWorld is compatible with iPad 2, iPad 3, iPad 4, iPad Air and iPad mini.